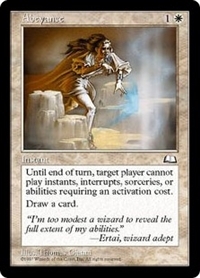 10/4/2004 Abeyance prohibits activated abilities of cards which are not on the battlefield. 10/4/2004 Abeyance never prevents mana abilities from being activated. 10/4/2004 Abeyance does not affect abilities which are not activated, such as static abilities and triggered abilities. It also doesn’t stop the declaration of attackers or blockers. 8/1/2008 This can’t be used as a counterspell. It will have no effect on spells which were on the stack when it was cast, nor on those cast in response to it.